Welcome to the MFT Product Launch for the March Release. I have 2 cards to share today with a common theme. I used Blueprints 31 and a cloud background to make matching card base, one vertical and one horizontal. I did a matted card base with the Blueprints 31 and added some masked clouds. Then I aded some grass along the bottom. I used the new Party Banners across the top, using Copic markers to color a rainbow banner. Next I added the smile die cut on the bottom using some blue fun foam to pop it up. You can see the colored fun foam here behind the white sentiment. I love that look! I finished off the card with some raindrops. I did one more card with the same base but this time added the cutest sentiment and tiger from the new set called Lions and Tigers. On this one, I added in a tree in the background and popped up the little tiger with some fun foam. I hope you are ready for some shopping because the whole March Release is available now! Head on over to the MFT Blog to learn and see more about all the details for this months release. Great cards, I love the sky, the new banner and the cute tiger! Nice cards. Very clean and simple. Love the rainbow banner! And your little tiger is so cute! Sweet cards! Love the little tiger! 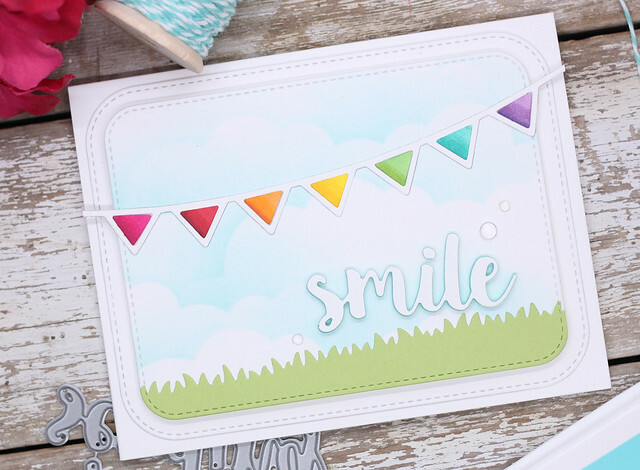 Both cards are cheerful and delightful! 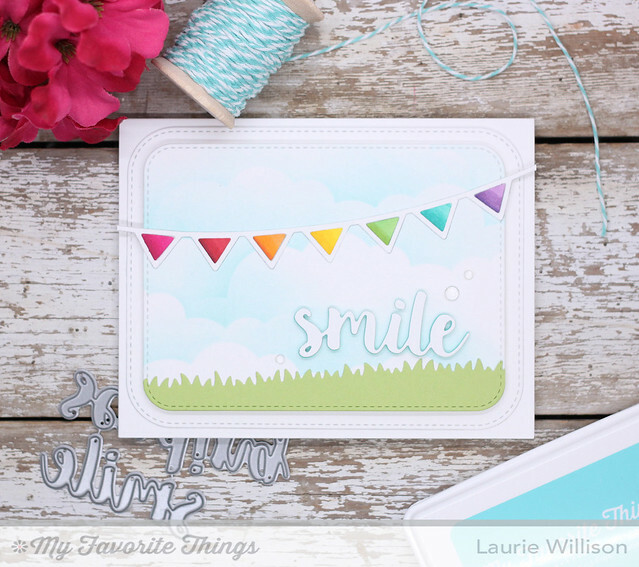 What a pretty, serene Smile card. Love the adorable little tiger. Fun cards. Love the cute tiger. Love the great cards, the cute tiger is definitely one I need to get. I really really like your banner card. It reminds me of summer! Very cute cards!Thank you for the hop! Very cute and simple, love them. Very sweet and simple designs. I love how the colors pop! Cute cards. I like the colorful banners on the first one. Super sweet cards.. Love the rainbow banner! I ordered Lions and tigers stamps set. Just adorable release! Your cards make me smile! Wonderful cards...love the raised smile sentiment and the blue underneath. Great cards! I love the multicolored banner in the first one. Cute cards. I like the idea of using the foam. Your little tiger is just adorable. Cute cute! Love the new stamps & dies! 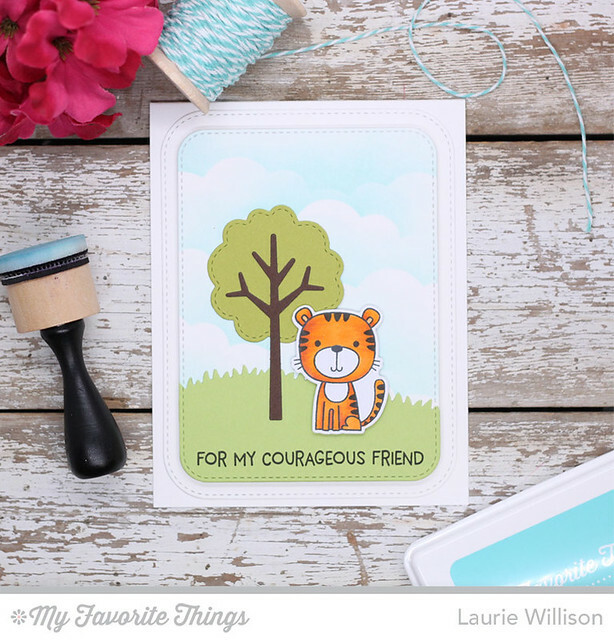 Darling cards Laurie! The skies look marvelous! Love these cards, Laurie! The new blueprints dies are so versatile. Simple, and so sweet!! I really love that first card; it's so peaceful and happy! 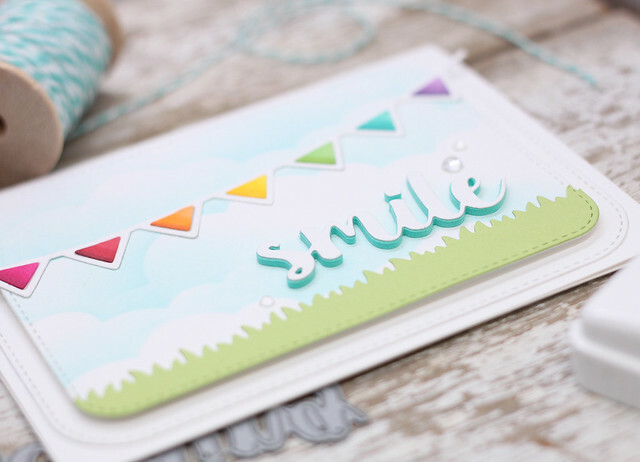 Love the soft colors on your banner card. Yummy! Beautiful cards. I love the simplicity. That smile card is so fresh and fun! I don't have the 'right' words to convey how I marvel over the magic you create with MFT products, so I'll just express a genuine, deep WOW! Your cards are stellar, especially the darling lion! Smiling brightly and feeling inspired! Both of these cards certainly made me smile. Love those life-like clouds in the background. Awesome! 2 sweet cards! Really love the first one! Love the cards. They made me smile. Such sweet projects. Love them both. That is so soft and springlike! Love the little tiger. Sweet cards! Love the banner and the tiger! I love the clouds! Such pretty cards my dear!